Detailing the physical features, habits, territorial reach and other identifying qualities of the Delicate Cycnia. 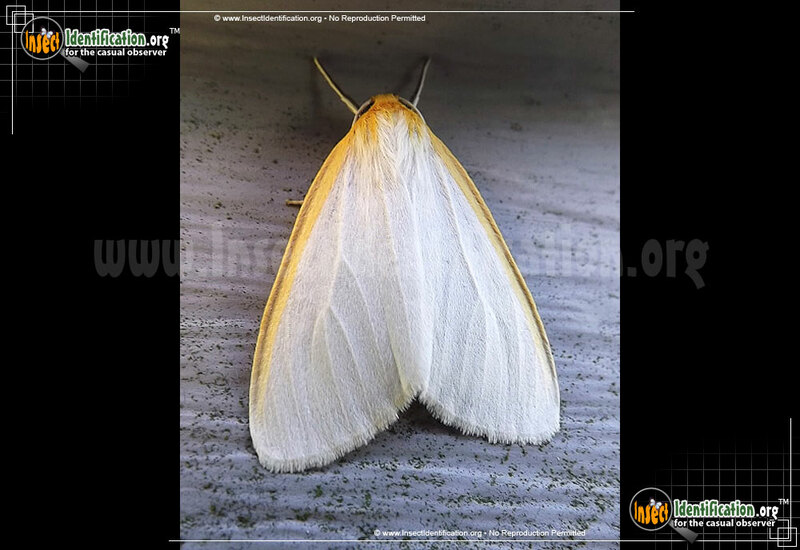 The Delicate Cycnia is also known as the Dogbane Tiger Moth, an ethereal gold and white moth with the uncommon ability to audibly communicate. Delicate Cycnias are a bright white with yellow on their head and on the edges on their wings. The white and yellow furry abdomen has 7 black dots on the dorsal side (back). More black dots line the lower side of the abdomen and pair up on the ventral side (belly). They are part of the Tiger Moth family, which sports some of the brightest and boldest moths in North America. Look for a Delicate Cycnia in garden, parks and meadows that harbor host plants. They can also be seen in fields and on roadsides. Males can make a clicking sound to both attract females and attempt to throw off predatory bats. This skill is unusual for a moth. Females lay small lavender-colored eggs shaped like pellets under leaves. Caterpillars are covered in long, furry hairs. At any given age, they may be white, gray, or tan. They eat the foliage of dogbane, milkweed and Indian hemp. Two generations a year can be produced.